^ "Amis",UNESCO Interactive Atlas of the World’s Languages in Danger,2018年/3月4日查閱. ^ Hammarström, Harald; Forkel, Robert; Haspelmath, Martin; Bank, Sebastian (编). Amis. Glottolog 2.7. Jena: Max Planck Institute for the Science of Human History. 2016. ^ Blust, R. (1999). "Subgrouping, circularity and extinction: some issues in Austronesian comparative linguistics" in E. Zeitoun & P.J.K Li (Ed.) 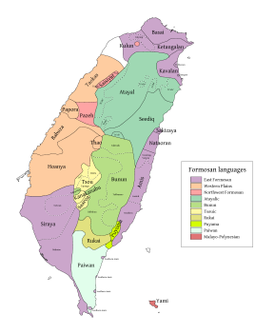 Selected papers from the Eighth International Conference on Austronesian Linguistics (pp. 31-94). Taipei: Academia Sinica. ^ 李壬癸/中央研究院,"巴賽語的地位"[失效連結],LANGUAGE AND LINGUISTICS 2.2:155-171, 2001. ^ Barbara B.H. Partee, A.G. ter Meulen, R. Wall,"Mathematical Methods in Linguistics (Studies in Linguistics and Philosophy)(語言研究的數學方法)"[失效連結],Springer,1/e 1993 edition(April 30, 1990). Edmondson, Jerold; Esling, John. "The valves of the throat and their functioning in tone, vocal register, and stress: laryngoscopic case studies" (PDF). [2008-11-13].